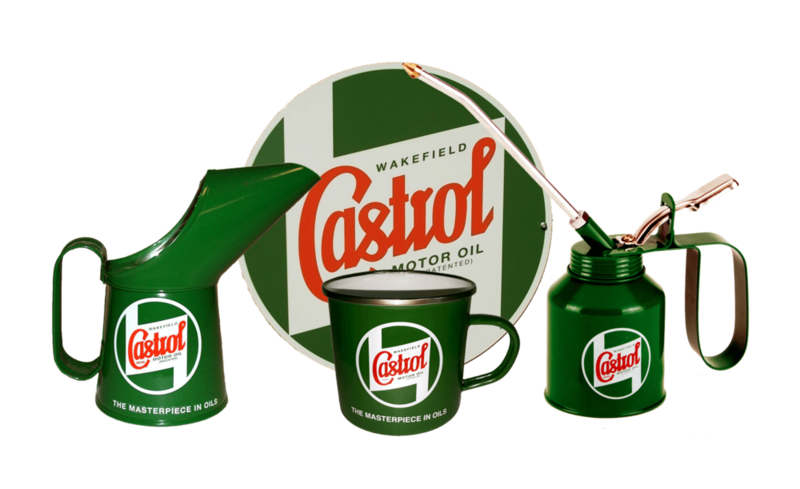 We offer a high quality range of workshop regalia, from pouring cans to wall signs, all with the iconic 1946 Castrol Classic branding. From the workshop to home, our nostalgic range combines both retro style and functionality. Including workshop accessories, clothing and more, there's something for every classic car owner or enthusiast. Whether as a gift for a keen motorist, or a gift to yourself, you'll find the perfect something in our range. Traditional style enamelled tin mugs. Perfect for a cup of tea when working on your classic, or to hold those important screws that you don't want to misplace! A classic style round metal sign, to add that retro feel to your garage or workshop. 400mm diameter, pre-drilled for wall mounting. Glass coated heavy duty enamel sign, a re-production in the classic Castrol style. 225mm wide x 180mm high, pre-drilled for wall mounting. A high quality glass enamel magnet; perfect for pinning your 'to-do' list of restoration jobs on the fridge. 65mm wide x 50mm high. A natural leather key fob, embellished with a glass enamel classic Castrol logo. Ideal for attaching to your classic car keys. A set of four A3 posters printed on high quality paper, depicting Castrol landspeed records from the 1930's and 40's. 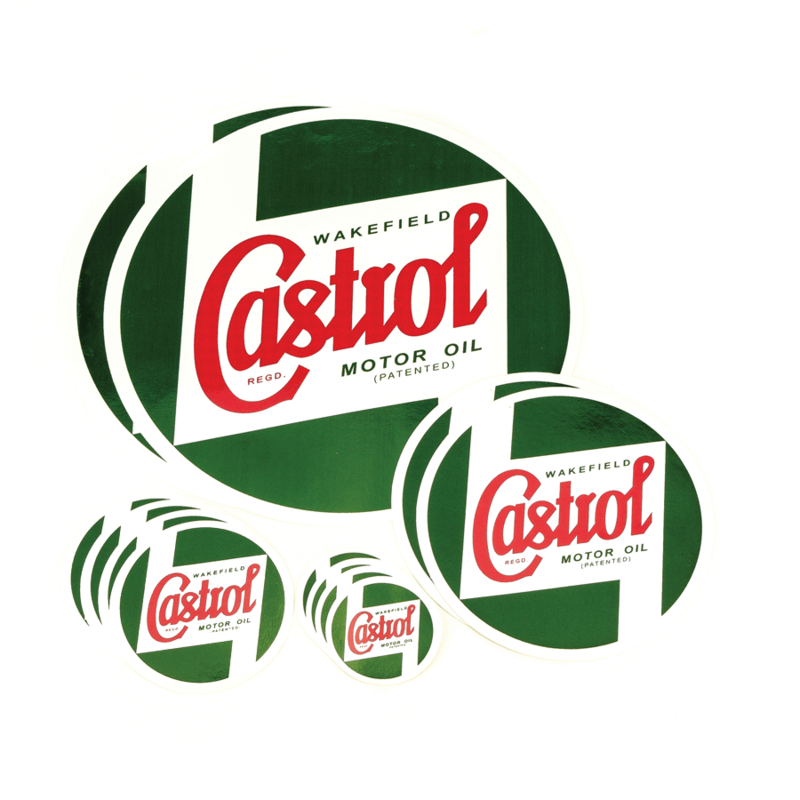 Glass enamel pin badge of the iconic 1946 Castrol logo. 17mm diameter. Classic golf style umbrella with a wooden handle and the classic Castrol logo. 140cm diameter when opened. An embroidered logo patch that you can fix to your racing or workshop overalls, for that period motorsport look. 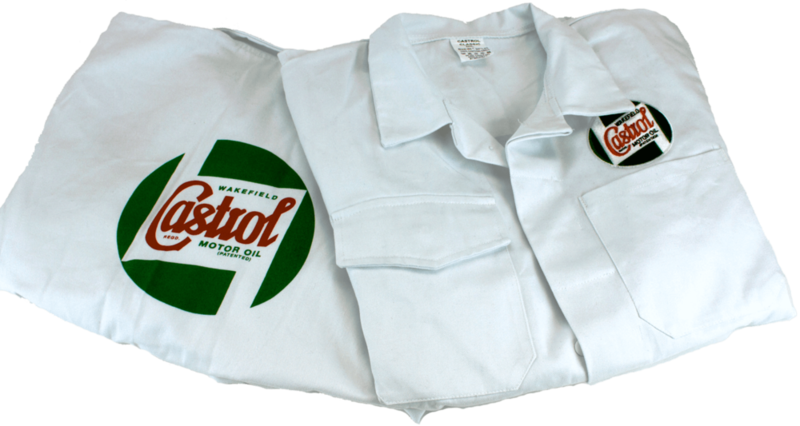 A traditional 100% canvas tool roll, in Castrol green with an embroidered logo. With 15 pockets, this tool roll is a stylish and practical addition for storing emergency tools in your classic vehicle. Cap with embroidered classic Castrol logo. One size fits all, with adjustable strap. Traditional cotton overalls, with the correct period style tool pockets as per the original 1940's overalls. Available in utility quality, and premium heavy duty quality. Heavy pique poly/cotton polo shirts, with an embroidered logo on the chest and sleeve. Available in black, white, or green, small to extra large. 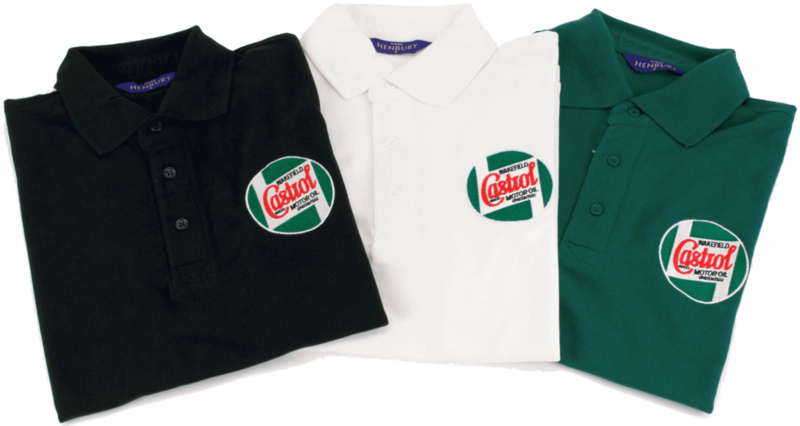 White cotton T-shirt with printed classic Castrol logo on the front. Available in extra small to extra large. Non-permanent bodywork decals. Available in 9" or 5" sizes. Includes 2 x 223mm, 2 x 132mm, 4 x 85mm and 4 x 50mm decals. Choice of A-post or windscreen service stickers, to remind you which oils to top up with, and when.